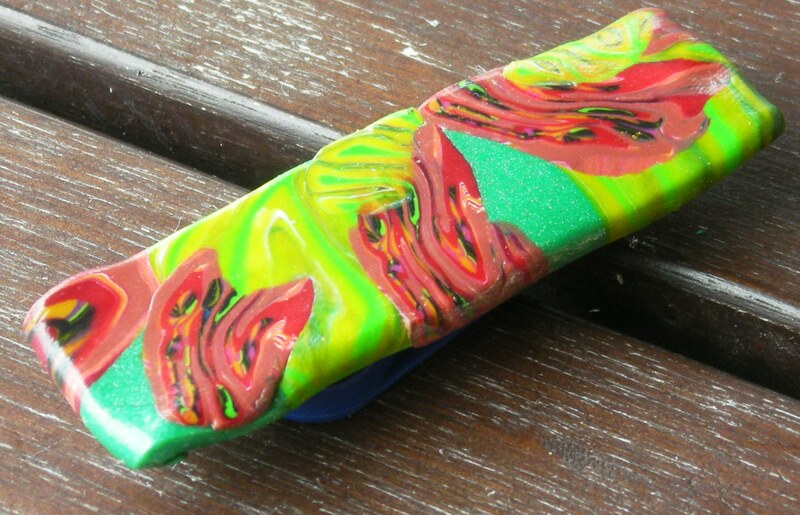 Several years ago I went through an urgent need to play with polymer clay. Polymer looks so easy… but how naive am i! I actually volunteered to create african trade beads for a vacation bible school that year. That is when I realized that my thoughts and the skills needed to produce great stuff out of polymer were not matched. I made beads… lots of beads, but those bead ideas that floated in my head were far from what actually materialized. That said I spent that summer attempting to perfect the art of making canes. Canes are delicately composed designs that are in a log, and each slice produces another copy of the design. I was on a jungle theme with large floral forms in bright colors. I baked them and glazed them, and threw them in a box, and put them away. All of these pins have a magnetic closure, which is easy to use, and makes no holes in clothing. So that is my discovery from the past. I don;t play with polymer often anymore, but have a deep respect for those who do… it is a skilled hand, and a patient person who makes this humble substance look amazing.